Losing Your Lashes During Chemotherapy? Avoid Extensions! Once hair extensions took off in the fashion world it wasn’t long before eyelash extensions came along. Silk and polyester threads designed to mimic natural lashes are dipped into glues and then applied (using sharp tweezers) to the root of the individual lashes on the upper eyelid. If you’re going through chemotherapy and losing your eyelashes, you may be thinking about extensions. Can you guess what we’re going to tell you? Uh-huh. Avoid them! Let’s start with the risks to the eyeball-and if you’re immune system is down, the corresponding risk of infection. Remember we said “sharp tweezers?” One false move and you could have an injury. According to Toxic Beauty author Samuel Epstein, M.D., California and Washington require eyelash extension professionals to be licensed, but many other states have no such regulations, so whether or not you’re getting someone adequately trained in the procedure is hard to tell. Did you know that eyelash tinting has been outlawed in Colorado and New York because of the risks of eye injuries? Strange that so far extensions are still allowed. Regardless of how careful someone might be, accidents can happen, and that’s not something you can afford while fighting cancer. Next, let’s look the supposed “comfort” of the procedure itself. The writer at closettherapyblog.com says the first few days after application, her eyes stung when she showered or washed her face, the roots of the lashes were sore, she had trouble cleaning out her eyes in the morning, and if one of the false lashes fell into her eyes it was especially painful. Depending on your point of view, these discomforts may be worth it for the results, but are definitely not something you want to risk while undergoing chemotherapy. “Sometimes the glue gets in the eyes and they get bloodshot, or inflamed,” says Eriko Furukawa at a Tokyo consumer consultation centre where many complaints have been made, “or the eyelid swells or natural lashes get damaged.” If you’ve got only a few lashes left, why would you want to take the chance of damaging them further? Now, let’s look at the glues used in these procedures. Most adhesives contained in eyelash extension kits contain toxic chemicals like formaldehyde-not something you’d want that close to your eyes at any time. 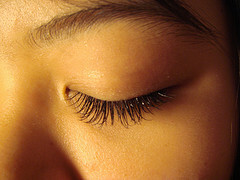 The Korea Consumer Protection Board examined the amount of toxic substances in 23 kinds of adhesives used to extend eyelashes and add false lashes, and found that formaldehyde was in 10 of them-at levels of 1,800 to 20,000 ppm (parts per million)-levels that can cause allergic reactions or perhaps even more serious consequences, such as the 16 reported cases in which the procedure caused inflammation to the cornea. Once your treatment is over, you can do some more research and make your own decisions, but please, while your immune system is down and your body is fighting for its life, just use a little toxin-free mascara and call it good! Have you had an uncomfortable experience with eyelash extensions? Let us know. Photo courtesy Star Haven via Flickr.com. I have a question that maybe someone can help me with I have a friend that has MS and has lost all of her eyelashes and she is feeling less of a women.. We have a stylist that is looking into it for us but i would like to help. Is there a clear adhesive out there that is longer lasting then what you can get a walmart or walgreens something where she can keep them on for more then one or two days…. Emily, thanks so much for writing in. I know you are very knowledgeable about the subject. We greatly appreciate you reiterating the concerns, particularly with those technicians who are not as experienced, and who may be using products that are below par. The key is to be careful with your health—be sure you’re going to a quality salon, with an experienced and careful technician. Thanks again! The FDA Says They’re Safe, but Can Parabens Cause Breast Cancer?